Our world is changing more rapidly than ever. Babson College recently released an eye-opening statistic: “Over 40 percent of the companies that were at the top of the Fortune 500 in 2000 were no longer there in 2010”. The book Built to Change by Edward E. Lawler and Christopher G. Worley claims the trend is accelerating, too. If it continues at this rate, 70 percent of Fortune 1000 companies will turnover from 2003 to 2013. 3 out of 4 of the world’s biggest, most successful companies will fall from grace by next year. Welcome to Digital Darwinism. It’s literally become adapt or die. TIME Magazine published an interesting article titled “Is Technology Moving Too Fast?” It was a warning; the main concept being the world was in “autocatalysis” – a state of perpetual self-accelerated development. As a result, the market for change could eventually hit a dry spell. People are struggling to keep up with technological advancements, because they occur more rapidly than most would consider healthy. That article was written in 2000. Lets look at what’s happened since then. 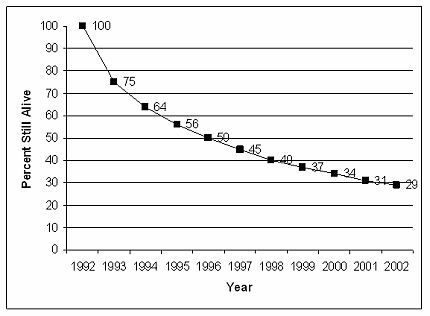 This graph shows how many businesses that were started in 1992 were still operating in 2002. 71% of them failed. Now check out this video by Brian Solis, author of The End of Business as Usual. Count the number of companies you recognise that are no longer operating. In a study of the 10 biggest bankruptcies in history, all 10 of them occurred this decade, and totaled over a whopping $1.5 trillion. That’s 12 zeros. We’ve hit the stage where the rate of change is making it almost impossible for companies to keep up. No wonder most businesses can’t stay in the Fortune 1000 for long! Some will now look at it as a death sentence – the business has hit its peak. But perhaps it should be seen as a challenge. What is your business doing to stay ahead of the curve? The Internet is the biggest technological and communications advancement in history. Now it’s hit the stage where if you’re not visible on the Internet, then you’re not visible at all. The same is becoming true for the social media revolution. And yet most businesses are still too afraid to dip their toe in the water, let alone go for swim. Entrepreneurship and the ability to pivot a business in a new direction when needed are so key to staying afloat. The most successful companies identify successful ventures just as quickly as they identify ones that are failing. They know when to invest, and when to get out. They also see opportunities and act quickly to get involved. So with the world’s technological advancements breaking through the proverbial ceiling on a weekly basis, organisations need to be on their toes more than ever. There’s no time to drag one’s feet in a world where being aerodynamic and malleable is the new structure of survival. One step ahead is no longer enough. We need to start predicting the trend that will replace the next trend, which is obviously easier said than done.